Hopefully by today (Friday, Dec. 14) road barriers will be gone at Holbrook and Jos. Campau and it will once again be open for traffic. Update: Holbrook is now open for traffic. By the time you read this, Holbrook should be re-opened for traffic. For the past several months, Holbrook from Jos. Campau to Gallagher has been under construction. New water and sewer lines were replaced and concrete was poured to make it a new road. For the past couple of months no traffic has been allowed on that portion. Work on the road was suspended for about a month when construction workers attached to this project and the I-696 project went on strike. That strike meant scaling back the Holbrook project scheduled for last summer. Instead of completely repaving Holbrook from Jos. Campau to Conant, work had to halt at Gallagher. There was barely enough time to complete it before cold weather prevented further work. Hamtramck’s Director of Public Works, Rodney Johnson, said earlier this week that all that remained to do is seal the joints of each concrete section and also stripe the traffic lanes. 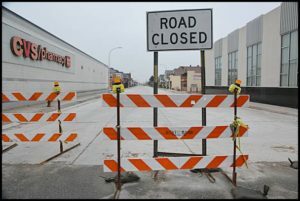 The street was expected to open by this Friday or Saturday. The project costs $1 million, of which the federal government is paying 80 percent. The city is kicking in the remaining 20 percent out of its yearly street repair fund. What Mr. Johnson should have pointed out that Holbrook will face rebuilding from Gallagher to Conant starting in the spring. Good luck to residents trying to find parking and having access to the front of their homes. For those of us who had to endure the construction mess from late July to late December, the lack of access forced numerous cancellations of doctor visits. We were “fortunate” to have the CVS lot (thanks CVS) and the large lot north of Holbrook off Mitchell. But it remains to be seen where residents who are facing the new construction project will be parking. Through out the entire process, communication from the city was a joke. Two letters from the engineering company and that was it. And even then the “letters” were thrown on to porches…. I found mine a soggy mess on my front steps. There needs to be more input from residents and business owners any time a project of the magnitude occurs in the city.